Life's too short to be unhappy at work "I'm working harder than I ever have, and I don't know if it's worth it anymore." If you're a manager or leader, these words have probably run through your mind. So many of us are feeling fed up, burned out, and unhappy at work: the constant pressure and stress, the unending changes, the politics--people feel as though they can't give much more, and performance is suffering. But it's work, after all, right? Should we even expect to be fulfilled and happy at work? Yes, we should, says Annie McKee, coauthor of the bestselling Primal Leadership. In her new transformative book, she makes the most compelling case yet that happiness--and the full engagement that comes with it--is more important than ever in today's workplace, and she sheds new light on the powerful relationship of happiness to individual, team, and organizational success. Based on extensive research and decades of experience with leaders, this book reveals that people must have three essential elements in order to be happy at work: - A sense of purpose and the chance to contribute to something bigger than themselves - A vision that is powerful and personal, creating a real sense of hope - Resonant, friendly relationships With vivid and moving real-life stories, the book shows how leaders can use these powerful pillars to create and sustain happiness even when they're under pressure. By emphasizing purpose, hope, and friendships they can also ensure a healthy, positive climate for their teams and throughout the organization. 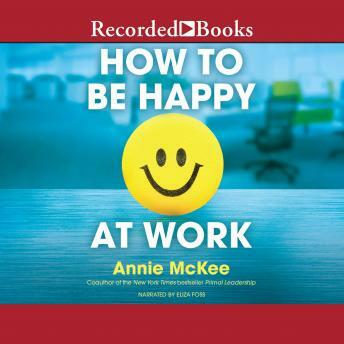 How to Be Happy at Work deepens our understanding of what it means to be truly fulfilled and effective at work and provides clear, practical advice and instruction for how to get there-no matter what job you have.